PRICE from650. Rare blue start from 800. Kittens in fuzzy stage especially blue so viewing highly recomended.. 1x brown rosetted boy .Deposit taken. 1x very rare blue rosetted boy 1x very rare blue rosetted girl .deposit taken for girl.. I can hold kitten if holidays are planned with prior arangements . An eagerly awaited new litter with my proven stud boy Diablo and my special girl Bellatrix lestrange Deposits highly recomended as they sell quick .. We are a fully registered TICA cattery DEVINESPIRITS. We are a responsible breeder that test all our breeding cats for the following.. HCM Hypertrophic Cardiomyopathy an inherent heart disease not only found in bengal cats with normal results.. PRA.b and PkDef with n.n.results we also test for felv and fiv both with n.n results. We also do blood group testing to ensure compatibility with all cats .. 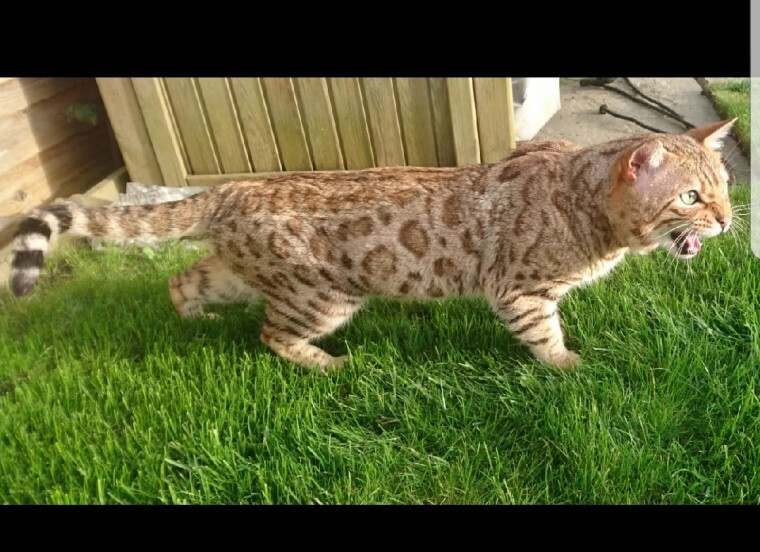 Both Mum and Dad are fully registered full pedigree Bengal cats registered for breeding. Mum has the well know Poshpaws in her pedigree.. Dad has supreme grand champion in his famiily.. Kittens will be well socialised with great temperaments used to small children and adults along with all the usual household noises .. Kittens will be available with both vaccinations INCLUDING leukemia and will come vet checked for health twice fully litter trained and flea and worm treated.. Also we provide a starter bag of kitty litter and a royal canin kitten starter pack voucher that includes food. goodies. money off coupon also they come with a blanket and teaser toy to get you started.. we can also organise micro chip if needed .. Mum and dad can both be viewed as they are our family pets I have included pics of my previous litters with same dad and mum . Any questions or advise don..t hesitate to contact me.. .Prices advertised for pets only. ..Breeder enquiries welcome.. ..Breeding cats WILL have individual vet certified genetic DNA test and blood grouping done to ensure compatibility and quality.. . NO WITHELD NUMBERS THANKS.